1 1/2" = 38mm Wide ben twin vintage one-piece leather jean belt. 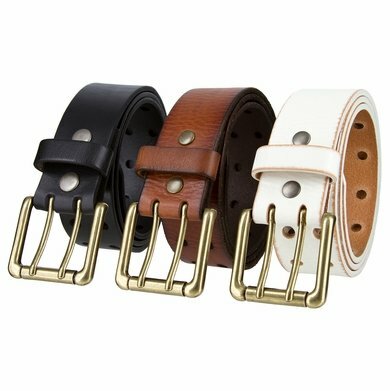 100% Soft Cowhide Leather Belt with Twin Rows of Adjustment Holes. Comes in different colors such as black, brown and white. Snaps for Easy Buckle Change. Antiqued Brass Twin Pin Roller Belt Buckle and a Matching Leather Loop.